Well, winter sure hit in a hurry, huh? With the threat of an ice storm coming in at some point on Sunday, J and I wanted to get our errands done fairly early in the afternoon. She was really wanting to get to Meijer and get the grocery shopping done, but first, I wanted breakfast. Sunday is the one day of the week that we still have some time to go out for a meal and I wanted to take advantage of it. Going out to eat has been getting a little bit tougher as L is getting older. When she was little, we could keep her in the carrier and she would be fine. After the carrier, we were still getting pretty lucky with a high chair and something to keep her distracted. Now, she’s pretty mobile and doesn’t want to sit still. She wants to crawl/toddle around and check out all the other customers in whichever restaurant we decide to eat at. Because of all this, we’ve been hitting chains more. It’s not ideal for us as far as food goes, but it works a lot better when we’re in a place where there are a lot of other kids and it’s nice and loud. It has been several years since I’ve eaten at a Cracker Barrel. I believe it was New Year’s Day about fifteen years ago. I don’t remember much about that breakfast (it was before I was 21, so no, I wasn’t drunk or hungover…no, seriously…I really didn’t drink until I was like 22…) and for some reason, I have never been back to a Cracker Barrel restaurant even though they seem to be everywhere. 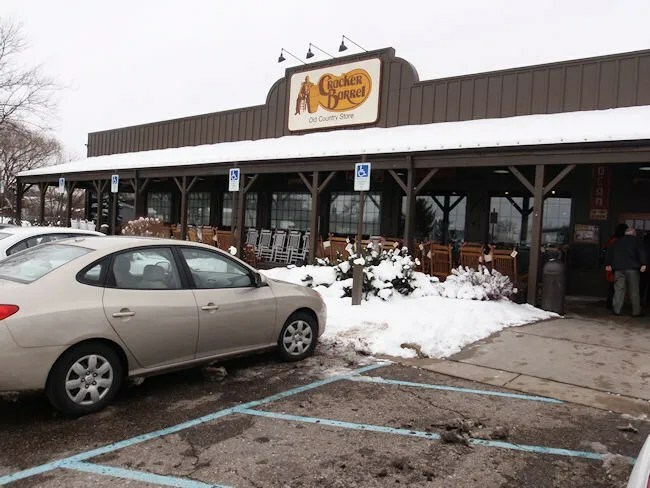 The Kalamazoo area Cracker Barrel is right off I-94 at the 9th Street exit in Texas Township. It’s a little hard to get to. While the address is technically 9th Street, you have to follow an access road past the Microtel Inn to get in to the large parking lot. The Cracker Barrel concept is pretty unique to the casual dining landscape. There are a lot of places that claim to do “homestyle” meals, but Cracker Barrel takes that theme to the extreme. The first thing you will notice about any Cracker Barrel store anywhere in the country is the row of rocking chairs on the porch as you make your way in. They are there for you to relax and socialize on nice days, but they are also there for purchase. Once inside the restaurant, you actually come in to a Country Store. There are all sorts of items for purchase. Clothes, bottled soda, stuffed animals, and a heckuva lot more. This store part of the restaurant actually saved me during the meal. L was really not wanting to sit and enjoy our company, so I had to get up a couple times and walk her around the store and let her play with some of the sock monkey’s they had for sale just so she wasn’t sitting at the table screaming. The restaurant was pretty packed at 11:00 on a Sunday morning which really isn’t much of a surprise. 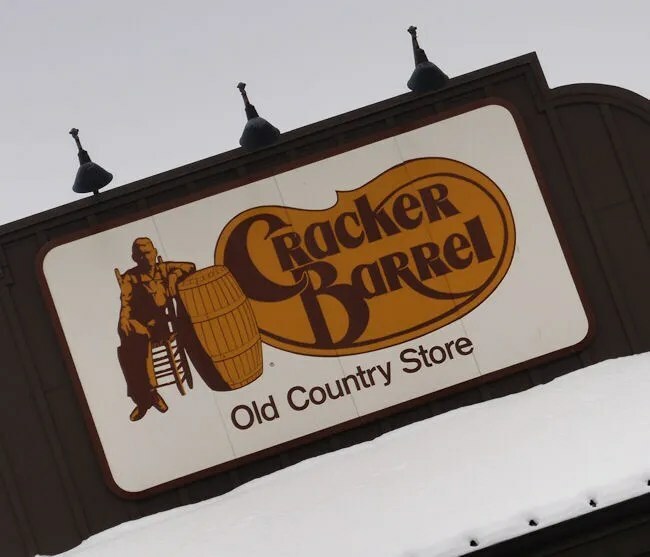 Like I mentioned earlier, I haven’t been to a lot of Cracker Barrel’s, but I have driven by hundreds of them and there always seems to be a lot of cars in the parking lot. After getting through the store, there’s a hostess station. I’m pretty sure we got one of the last tables because while I was playing with L in the County Store, I heard a lot of pages for tables being ready. The large dining room is decorated to resemble a small, kind of rustic, country restaurant. They actually have a warehouse in Tennessee where artifacts are stored for future restaurants. There are wooden peg solitaire games on every table and there are a couple tables scattered throughout the restaurant with games of checkers set up. Our waitress was taking care of the table right behind us when we sat down, so we didn’t have time to really look over the menu when she turned to us. We had her grab drinks (a Coke and an Orange Juice) while we looked over the large breakfast menu. You’ve really got to read menu descriptions to find what you want. A lot of the breakfasts have multiple choices for meats, sides, etc. 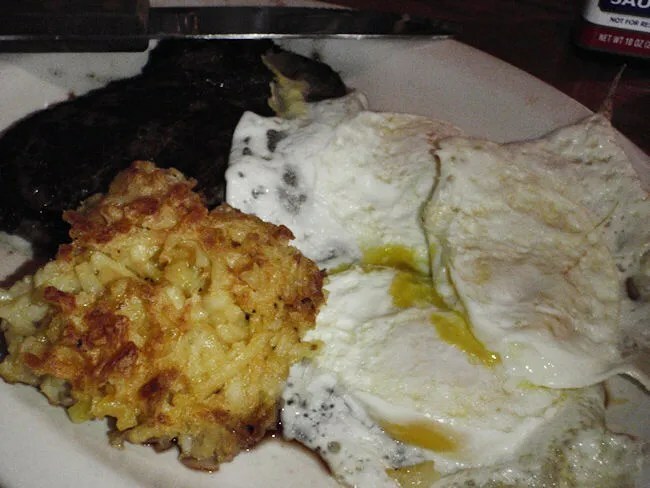 I, of course, wanted steak with my breakfast and I found that option with the Cracker Barrel Country Boy Breakfast. You get the choice of Sirloin, Country Ham, or Pork Chops. I wanted the sirloin which I got cooked medium. This was actually one of the better steaks I’ve had at breakfast. It had that nice, seasoned grill taste to it and didn’t require the A1 that was put on the table. The accompaniments included two eggs (cooked over medium), Hashbrown Casserole, Grits, two home made buttermilk biscuits with Sawmill gravy and fried apples. I actually passed on the grits knowing I wouldn’t eat them. The hash brown casserole was pretty good, but not really my thing. J actually really liked it and I offered it to her instead. It was a little cheesy and a little potato-y. The buttermilk biscuits were delicious. 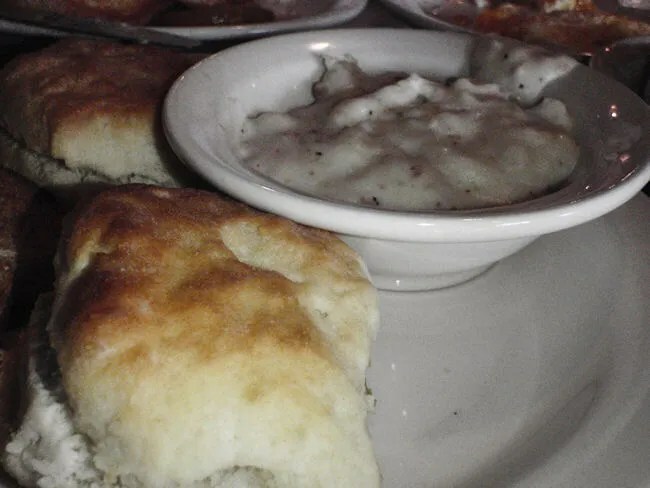 I just used the butter that came with them as I wasn’t really in a gravy mood, but it’s a nice option to be able to do a little biscuits and gravy side to your meal. J’s choice was the Momma’s French Toast Breakfast. 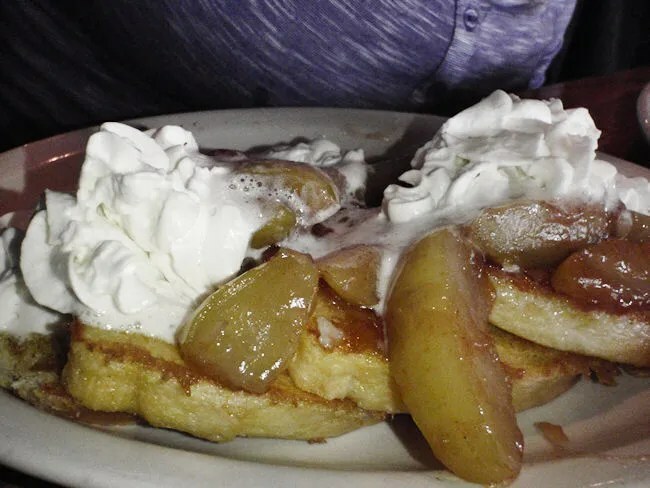 Four slices of sourdough bread is topped with fruit (J’s choice was apples) and whipped cream. The breakfast also comes with eggs (scrambled with this plate) and choice of meat (bacon, of course). J said the French Toast was really good and she tried sharing both some of the toast and some of the apples with L, but she just wasn’t having it. Unfortunately, L wouldn’t sit in her high chair and eat, so J spent a lot of the breakfast holding on to a baby while trying to eat. Our bill was right around $30 after we added on some toast for L. It seems like a pricey breakfast, but there was a helluva lot of food. Cracker Barrel serves big, “Country Style” breakfasts, so there’s really no reason you should leave hungry. I’m still going to be the type of person that would prefer to find a great local diner for breakfast, but Cracker Barrel actually surprised me. The food was pretty good. I have no problem saying the steak I had was one of the best breakfast steaks I’ve had at a restaurant and there was no worry of leaving hungry. I guess we’re going to be doing take out a lot more often from now and and it’s nice we’ll be able to rotate Cracker Barrel’s breakfast in with Bob Evans‘ on Sunday mornings. It’s not my ideal breakfast place, but it’ll do. I read you got 2 eggs with your breakfast, I thought you were suppose to 3 eggs with the Cracker Barrel Country Boy Breakfast.!! It might have been three…actually looks like three in the picture. I ate so fast due to cranky baby that I must not have been paying attention. I had breakfast at Cracker Barrel yesterday, Feb. 4. Had the oatmeal breakfast, bowl of oatmeal, brown sugar, small dish of fried apples, apple bran muffin and a small carton of milk, $4.19. I’ve had oatmeal at McDonalds, it’s a very small container for $1.99, there is no comparison. The CB breakfast is three times as much food for a little more than twice the price. McDonalds oatmeal is good but the price is way too high, it should be on the dollar menu.